Register today at Hula Spins and get chance to win amazing prizes including Amazon vouchers, 500 Free Spins on Starburst and Fluffy Favourites! Launched in May 2018 turned into a mammoth month for Jumpman Slots with almost every other new slots site opening opting for that platform. Hula Spins became the latest at the end of the month and continued the tradition of good graphics and better games. As ever we just remind everyone to be watchful of the wagering requirements. Make a first deposit of £10 or more and get your first spin of the Hula Spins to win prizes including Amazon vouchers and win up to 500 spins on Starburst, Fluffy Favorites or other selected slot games! 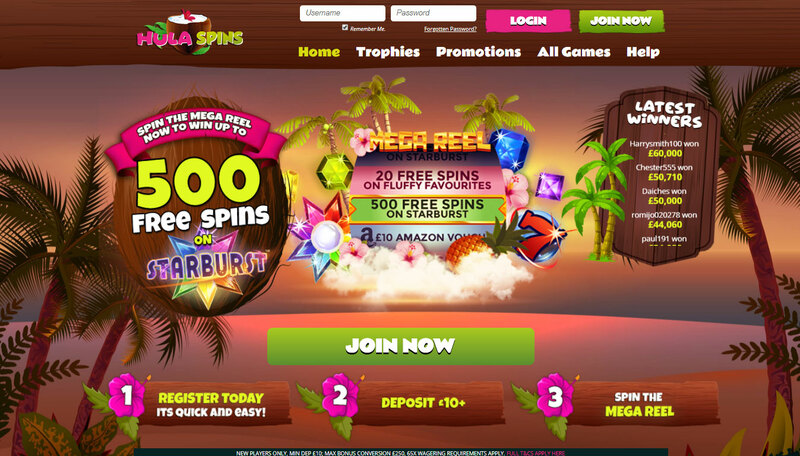 Hula Spins – from the second deposit onwards it takes a £20 deposit to trigger a spin of the Mega Reel. No spin of the Mega Reel will be made available while there is a pending withdrawal. Access Hula Spins via any mobile device on your favourite mobile browser. The games are fully optimised for mobile play on any android or iOS smartphone.